While it's untrue that shouting, "Boo!" at them won't knock Hudson/Related's sadly under-designed holiday decorations over in Riverwalk Commons, it doesn't take much more. The artificial tree on the right has been relaxing for a couple of weeks, its partners preparing to follow suit. 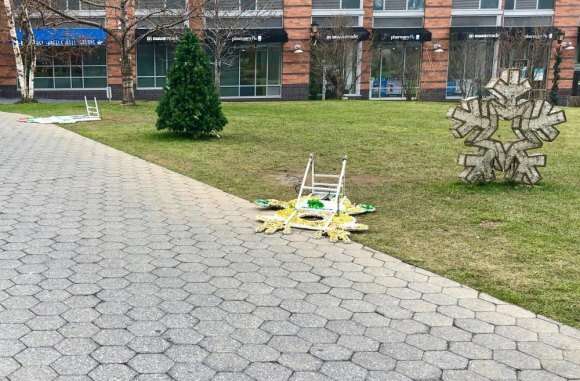 Listen, guys, the holidays have passed, and even though the installations didn't fare well at the height of the season, their remaining on post-season display is embarrassing. Or should be. Time to put them out of their misery. Ironically, the only elements set up in Riverwalk Commons that haven't been insulted by the elements or electric failures are the puzzlingly gray snowflakes, which stand tall like enlarged slush cookies. Trees with lights strung through them have mostly either lost electrical connections or tipped over. 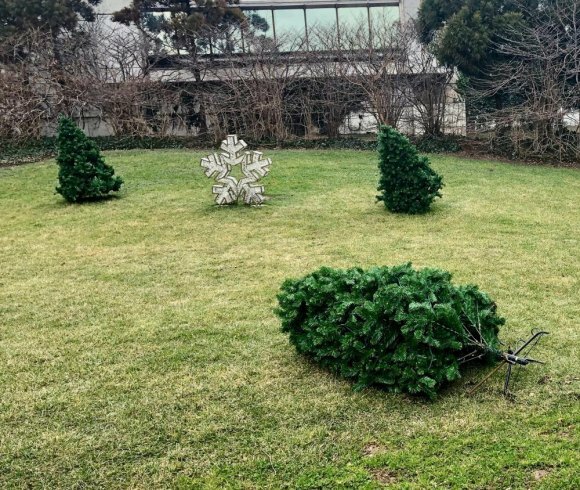 One inglorious faux conifer has lain on its side, lights still functioning, since before Christmas. Another leans perilously as if putting its shoulder to the prevailing winds. But for sheer poor taste, you can't beat the hopelessly lightweight peek-a-boo figures that spend a sad part of their lives face to the turf, tipped over by breezes, rambunctious children or, maybe, adults trying to make the point that it's time to go. Inexplicably gray snowflakes add to the Riverwalk Commons dispair. How about it, Hudson/Related? The rest of the Winter Wonderland came off pretty well, a great improvement over last year. Why let this public embarrassment spoil the legacy?